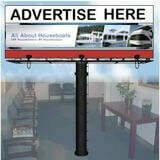 Houseboat Surveyors for marine surveys on house boats. We're thinking about getting a house boat survey, and are the cost of marine houseboat surveyors inspections worth the price? We are looking at a few older houseboats, and some are steel and fiberglass. Are budget is limited, so we don't want to spend our money needlessly. Do you recommend getting a marine survey done before purchasing a used houseboat? Well Craig, welcome to the houseboat forums, and congratulations on your decision on buying a houseboat. 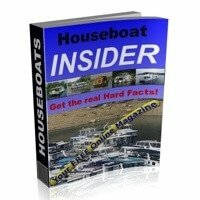 When it comes to your question about getting a marine surveyor to do a survey on your prospective houseboat purchase, my opinion and recommendation is YES, and it is definitely worth the price or cost. Depending on the size of boat, professional surveys are generally under a thousand dollars, and can very often uncover serious or necessary structural repairs or conditions. One way that you can save money on is by doing a DIY Houseboat Pre-Inspection before calling in a professional surveyor. 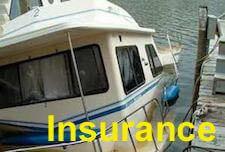 Insurance companies usually ask for a recent marine survey to be supplied when it comes time to insure your houseboat. Many marinas nowadays require proof of houseboat insurance coverage before granting docks and slips. I know the cost or price of a boat survey seems as an extra negotiable expense, even before you bought the boat, but they are worth their price in gold when they save you from buying a financial wreck. Personally I wouldn't buy a used houseboat without getting a houseboat inspected by a qualified marine surveyor, who can supply me with a full report on the condition and estimated value of a vessel. Lastly, hopefully some of our readers will share and post comments about their houseboat surveys and marine surveyor experiences. Feel free to use the "Click here to post comments." link found near the bottom of this page. 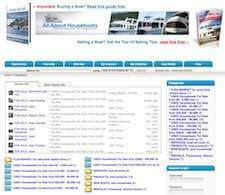 Comments for House Boat Surveys - are prices cost of marine houseboat surveyors worth it? I found a 1997 14x48 Myacht priced at $57,000. I was prepared to pay $55,000 and made a first offer of $51,300 subject to a marine survey. The sellers both work for insurance companies but acted like they didn't know what a marine survey is. They rejected my offer with no counter and a week later reduced their price to $55,000. I then bought, after a thorough $900 marine inspection, a 1999 15x48 Playcraft for $55,000 ? newer, bigger and with finishes far superior to those on the Myacht. The surveyor was spot-on about all that was good and all that was deficient in the boat (particularly that it needed a new generator) and we now love our boat. The Myacht is still on the market and listed at the price I was willing to pay four months ago. I can't help but think the Myacht sellers are afraid of a marine survey ? especially since they would not turn on any of the mechanical systems or take me out on the water unless I was "really serious." I had driven six hours for our appointment to see the houseboat, and I had $60,000 in boat money in my checking account at the time. Do not be foolish ? get a marine survey! and am waiting for the weather to break for the SAMS surveyor. This will be my third houseboat. I got real lucky on the 1st w/o a surveyor, (another RQ) but later bought a 57' houseboat with a fiberglass problem that had been gingerbreaded to cover the needed repairs. Had I had a survey done by a SAMS surveyor, I would have saved thousands of dollars. While most financial lending institutions require a survey as do most legitimate insurance companies for older boats, the extra money spent here will give you nothing but piece of mind later. Guaranteed. Good luck. Well Ray, I couldn't have said it better myself. Thanks for sharing your experience. We were new to buying a houseboat and bought a 1972 steel Stardust Cruiser and our insurance company required a survey and it was the best thing we did. He spent half the day in the engine compartments teaching my husband all about the engines and generator.... We learned so much about the good and bad of a used boat and what needed to be fixed. Be prepared, insurance company may not cover until items are fixed. See if the owners have a recent survey (2 years or less) and that will save you the cost. Is the Cost of Survey Worth it? I was in the first hundred graduates of the SAM surveyor school. That was 20 years ago. Since then SAM has grown a good reputation. Fact is not all marine surveyors will do the same job for you. As in all industries there are the top 20%, the lowest 20% and those in-between. 1. 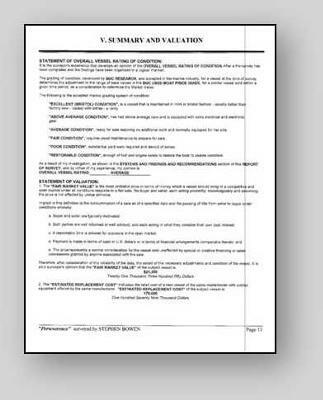 Do not use surveyor suggested by the Seller. 2. Talk anonymously to a few marine insurance issuers? 3. "I've got a good buddy" or "my surveyor was great" is not really definitive. YOU do your own due-diligence. 4. Before I graduated as a Marine Surveyor, I bought a boat in Florida and had a Surveyor from Texas drive to Pensacola to do the survey. a) He was not local. b) He had a "straight shooters" rep with insurance and sales people. c) He wrote very lengthy and detailed surveys. 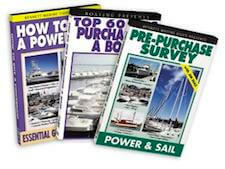 I actually did very few surveys after graduating as I was older and became a surveyor to learn, in detail, how to NOT make a mistake in buying a power boat with twin Diesels as I had been sailing for 30 years and lacked enough knowledge that I would have become a sitting duck for a Broker. Got lucky on the Broker and found the "perfect" boat for me. IF you pick the right Surveyor ... You will never have more bang for your buck. Pick wrong and you are a floating potato chip. I want to thank you for the great surveyor tips, and that it is definitely worth it. I would like to recommend a marine surveyor I hired to survey a houseboat on Lake Cumberland in KY. His name is Bill Burke of Northwood Marine Services. 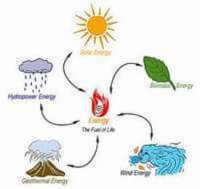 Robert, thanks for taking the time to share this valuable information with others. Marine Surveyor Schools - "Graduate of SAMS" ?